What do you do with the cans and jars your food comes in? Most of us recycle them or (cringe) toss them in the trash, but not Samuel Bernier. 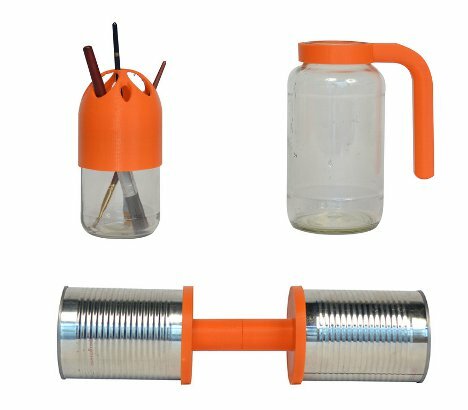 He had a 3D printer and a really, really good idea: he could reuse all of those containers by just printing some custom lids and connectors. His ingenious concept brought about Project RE_. Using nothing more than standard empty food containers (like tin cans and glass jars), Bernier created 14 brand new objects. The suite of awesome stuff includes a watering can, a paint brush cleaner, an hourglass, a citrus juicer, a rain catcher, a bird house, a bird feeder, a spaghetti container, a dumbbell, a lamp, a snow globe, a mug, a piggy bank, and a maple syrup jar. The printable parts of the objects were all designed to be printed with any old 3D printer, even the super-low-end DIY models. 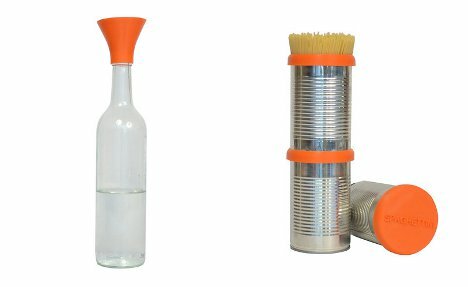 With the simple collection of snap-on and screw-on printed pieces, the used-up containers that would ordinarily be discarded can be upcycled into something totally new and actually useful. According to Bernier, this is how 3D printing will change our lives for the better in the future – and we believe him. The inventor plans to create even more objects in the future, the plans for which will also be available for anyone to download. 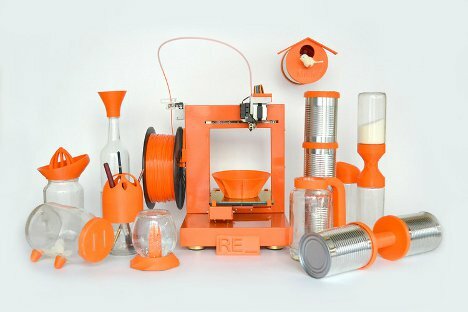 He also encourages other DIY, recycling, upcycling, and 3D printing enthusiasts to come up with their own ideas for more amazing new objects. See more in Industrial Design or under Technology. August, 2012.